The FBI was among many organizations recruiting at a Career Fair held at American River College last Thursday. Alexandra Vaniw, a psychology major, stopped by the FBI table. “I always wanted to go into behavioral analysis,” said Vaniw. Besides the FBI, the Sacramento Sheriff’s Department, the California Highway Patrol, AmeriCorps, Verizon and Vivint were among the 52 organizations at the fair. At the sheriff’s department table, Lelia Serranzana, a records officer, said that students can apply for a variety of jobs that are open, from deputy to office work, and that the department is looking for students who are hard working, have integrity and are team workers. Attendees of the Career Fair could also get information about getting a state job. Solmaz Sadeghi, an accounting major, said she got an information packet about getting a job at the Social Security Administration. Tania Maldonado, a gerontology major, was also looking at getting a state job and talked to Sally Bennett, an IT Recruitment Coordinator at the Department of Child Services. Bennet had positive things to say about ARC students. Milo Stubbington, manager at the Welk Resorts marketing company, said the company offers students a chance to work at venues such as sports events like Oakland Athletics and Sacramento Kings games. Lake is considering a seasonal job as a driver for Morning Star during the tomato harvest season. Laura Larson, a psychology major, said she came looking for resources. “I am also helping my roommate to get some information,” Larson said. According to event organizer Jennifer Garcia, about 750 attendees and 52 employers were at the fair. Garcia said that the goal of the event was “employment and information for students,” and that if students missed the fair, another one is to take place in the fall. Garcia said that for the fall event, the plan is to have 85 employers. 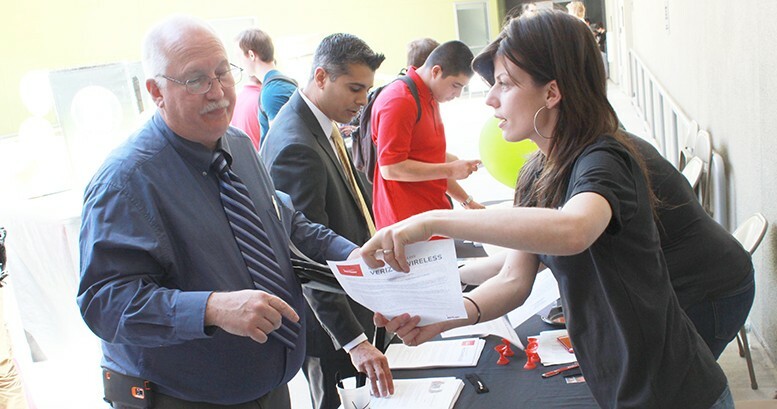 Be the first to comment on "Career Fair brings employers to American River College"